We spent Thanksgiving with Aaron's side of the family this year. And at the last minute, it turned into a marathon vacation. Which has been great, and fun, and wonderful. But Jack told Maddy this morning that he wants to go home, so I guess it's time. This Thanksgiving I felt especially grateful for my family, and was happy to be able to spend so much time them. We were able to hang out with Abby, and Matt, and my mom in Bakersfield- then in southern California with Aaron's family. We celebrated my mother-in-law's birthday which landed on Thanksgiving day this year- and gosh do I love her! I honestly have the worlds BEST mother-in-law! And I've decided that California has the best weather- even when it rains. It was nice to remember what it's like to not freeze or have snow on Thanksgiving day. I have to say, I could live like that again ... easily. 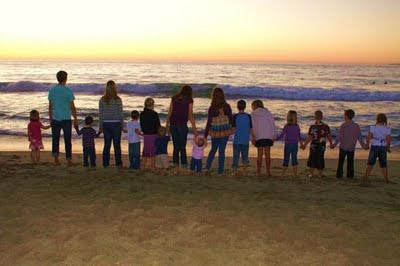 The picture above was taken of all of the grand kids on Aaron's side of the family on Thanksgiving at sunset. Aaron's sister, Aimee, insisted we take some photos at the beach, and I am so glad she did. 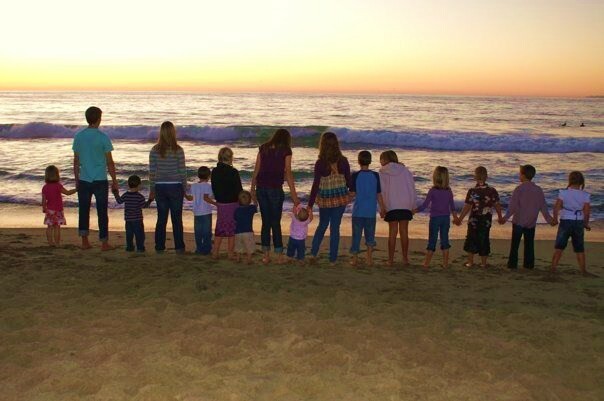 Love this picture, love all of those kids, and love that beach. And I loved our Thanksgiving of 2009. Mandee, that is the cutest picture! Glad you had a wonderful time. Glad Amiee took this picture of them. It is really great. Love the cool picture on the beach. I'm so glad you got such a long vacation in nice weather. I'm jealous. Can't wait to get together this week. Such a cute shot of all the grand kids!! i love you too! thank you for coming to my thanksgiving birthday. i loved every minute of it - how could i not? all my children and grandchildren with me.